Thanks for the opportunity to discuss OLPC again. I am not unbiased since I was responsible for the design and implementation of “Una Laptop por Niño” but I think my contribution may illustrate some of the points described in the article. To begin I would like to point out the reality upon which “Una Laptop por Niño” was developed. In January, 2007 a census evaluation applied to 180,000 Peruvian teachers showed 62% of them not reaching reading comprehension levels compatible with elementary school (PISA level 3) 27% performed at level 0 or less. 92% of the teachers evaluated did not reach acceptable (6th grade level) performance in Math. After 200 hours remedial education in reading comprehension still about 15% stayed at level 0. It was clear to us the main challenge for our project would not be “teacher training” on how to use computers in the classroom because most of our teachers needed exceedingly much more than ICT literacy courses. Public schools did not receive any maintenance for years, most of the largest schools known as “emblemáticos” that were built in the 1950’s had not been subject of any maintenance and were literally falling apart. One of them, with a capacity for almost 5,000 students had less than 2,500 because anyone who could run away from public education would do so. About four thousand schools (5% the number of schools but about 30% the Public school student population) had connectivity but very few of our target schools were connected because of their remote location. The poorest and most remote schools are the most difficult to serve and therefore usually left for the last stages which seldom really happen. Any widespread effort to improve quality of education should aim to reduce the gap between the poorest and the less poor. The hopelessness plaguing children in extreme poverty areas had to be confronted. Access to technology is not a panacea but could certainly contribute to help children feel empowered. It is widely recognized children have a natural trend to learn how to use technology. Wealthy schools don’t question if their students should have access to technology. Why should the poorer? We saw the project as a way to reduce the digital divide. Our justification was evident enough for the Congress to pass a law approving the program, surprisingly without a single opposing vote in spite of the diversity of congresspersons. 1. Do any ICT interventions have impact? Or are we all just wasting our time with technology? All interventions, not only ICT interventions have impact. The problem is to figure out what the impact is and if it is good or bad. In the case of ICT, as the IDB report wisely points out, the effect is neither magic nor fast. What is surprising is how many apparently sensible people expect magic fast results and are ready to criticize the effort made after such a short time. An educational system in such poor shape as the Peruvian will take, in my opinion 10-15 years, just to improve the quality of its teachers. Something needed to be done in the meantime. We thought giving children access to a technology designed as a tool to learn with, was a step in the right direction. I don’t think time is wasted with technology, however it is not measuring how much more Math or History have children learned in the traditional way that we will see the impact. 2. Do we actually know how to measure the impact of ICT on education? Or are we testing the wrong things to see impact? I think “those who have a hammer see everything as a nail” is a proper way to describe the ways many evaluations are done or, even worse, looked at. In the case of the IDB study, having participated in the design and first stages I can assure the study was very well thought. However, as soon as the initial findings were reported, every interested party tried to “llevar agua para su molino” (bring water to its mill). For example, I heard many advocates of the ICT industry (the main detractor of the OLPC approach because it impacted its market share numbers) use the results to say the project was a failure and their approach should have been used. There were no impacts in cognitive results because, as we knew from the beginning, no results could be reasonably expected so soon. We were not (I should say they) testing the wrong things, not only the cognitive abilities were measured, but also the attitudes and expectations of students parents and teachers which actually showed improvement. Students became more critical of the schools system and expected more of it. That is an important outcome that will certainly impact the quality for the system in the long term. 3. Can any single intervention have impact? Or do we need to have more interventions over longer timeframes for impact? a school maintenance program that assigned about $500 per classroom directly to principals for minor maintenance tasks at all public schools countrywide. Most of the efforts will have long timeframes. The problem is the vicious tradition among politicians to stop everything done by their predecessors and trying to begin everything anew. We tried to resist the tradition and maintained most of what we found that we thought was in the right direction. Una Laptop por Niño was built on the foundation set by Huascarán project. Our Educational Resource Center concept evolved from the Pedagogy Innovation Classrooms and the Robotics in elementary school program was designed to capitalize on the original ideas proposed by the MoE team back in 1996. 4. Are all laptop programs doomed? Or was Peru’s approach itself the problem? I don’t think laptop programs are doomed, I did a study of impact of the program on intrinsic motivation towards school work and the results confirmed all the hypothesis. Students feel better and their readiness to work hard to learn things they think are important improves significantly more for participants in “Una Laptop por Niño” than for those who did not participate. Written by Oscar Becerra on March 13, 2012 in OLPC in Peru. Oscar, thanks a lot for your thoughful article and comments. Looking at the ongoing IADB evaluation and everything else the fact remains that Peru has spent more than USD $ 150 million (roughly $5 per inhabitant) on XOs alone and has few positive outcomes to show for it (at least at this point in time). As such I do have to wonder whether it wouldn't have made more sense to dedicate those resources (or a large share of it) to the other "articulated actions" you mention in your reply to question #3? "It has undoubtedly opened enormous possibilities for thousands of teachers and pupils which will come up with interesting and creative ways to use the XOs and learn a lot in the process. Yet there’s no doubt that the majority of teachers and pupils as well as other stakeholder such as administrators and parents will hardly see any benefit from the initiative." It's not that there's no value – even if we might have to dig deeper, dig somewhere else, or wait longer to find it as you, the IADB report, and many other people point out – but that the bang-for-the-buck value of this intervention seems to be fairly low. It is a pity spending more alone will not may any effort better. I think we spent what needed to be spent in each of the articulated initiatives we took, like teacher remedial education. Each of the "level 0 reading teachers" got 200 hours reading training in 2007. Arguing about beliefs is hard because it has to do with faith so I will not respond to what you "believe" except for saying I respect your beliefs but don't share them. Oh, and I forgot to ask whether the study on intrinsic motivation which you mention in your reply to question #4 is publicly available somewhere? I really enjoyed this article. Somehow I get the message that perceiving real benefits depends on how we measure them. I´ve been for many years trying to understand the impact of telecenters in community life and its difficult to understand how they really work at a community level and even at the individual level. Some benefits are difficult to measure and some are only observable in the long run. ICT produce a sense of belonging, of being included, even of success, that is not detected by any quantitative measure. But, at the same time, this sense of inclusion, seems to affect other aspects of people´s life. I agree with Oscar when he says that "those who have a hammer see everything as a nail". Our work is to understand what is happening that we are not seeing and how we can use that to promote a better education. Oscar, further to your point #3, I'm curious: now that Peru and DIGETE have invested so many resources into the OLPC program, do you see any areas ripe for further spending (some of which might be of low cost relative to total spent on OLPC so far)? I ask because it seems you are saying that the impacts of the program are yet to be seen or realized, but you also mention the threats from withdrawn political support, so it is unclear to me whether you think Peru would be on track to see long-term gains from the program or is in danger of losing the chance for long-term positive impact entirely. I'm wondering about infrastructure, further training (whether directly for teachers or for accompanied support), software development, improved curriculum integration guides, etc.). — Are there any activities you could identify which would be the best opportunities for Peru to invest in now with a view towards capitalizing on the investment in XOs already made? You are right, there are lots of options. Just to mention one that is a low hanging fruit: amlocal software firm developed for us a six hour version of its reading comprehension SW that may be used for free in the close to a million XOs countrywide. The only thing needed would be to install the SW train teachers to use it with studnets and remove it after usage, which is a little investment with lots of potential return. We did not do it because the SW was ready at about the same time we left office. Now it would be up to regional governments to do it because I understand DIGETE budget is deeply reduced. 1. At what point do your parents (or whoever takes care of you assuming there even is such a person) tell you you cannot go to school anymore (it has been an excellent baby-sitter alternative from the parent/caretaker's perspective) but now it is time to get out and get a job, earn your keep and so on? 2. At what point do your parents tell you you must move out because there is not enough room or food or tolerance for your youthful ways? 3. At what point do you get married and hopefully assume full responsibility for your partner and any children? Clearly there are other turning points and I would love to hear of those that others may want to offer, however, the interesting aspect to me is how education in Latin America relates to the critical turning points in a young person's life. To me the value of OLPC or any out of the ordinary education approach is the extent to which it opens the world to a young person who has nothing to read and poor understanding of how what is learned when reading even has the potential to benefit that young person. I am not surprised by the educational attainment of the average teacher in Peru. Do they need to be more tightly drawn into the learning community and mentoring using technology? Is the end-run approach implicit in OLPC miss the opportunity to build the educational community of school leaders and teachers and others? Maybe not, but it has always struck me as a bit arrogant to assume OLPC can drive forward with the current apparently main commitment to child use. So the big question is what are the realistic life opportunities that education and computer-supported education offer to poor children in Latin America? Is there a passport to opportunity to be found in a rural school, an OLPC, an inspired teacher, or are there other approaches, e.g., vocational training and job mentoring as in Germany, that offer more to these young people to find their way in tough circumstances? I guess when it comes to the point of "capitalizing on the investment in XOs already made" the core question is also what the larger goal is with regard to this capitalization? Well said Oscar. It's nice to read you again in the EdTech debate. One thing that stood out for me from your original post was the idea of how one even defines success, much less measures it. In other words, one man's failure may be another man's success: You said: "You say the impact and usefulness are very small. Compared to what? When the father of three children mentioned how proud he felt about his nephews from the city now visiting them on the weekend because “they don’t have computers in their homes or public city schools” should I have told him not to be so enthusiastic because your kids don’t have access to Internet yet and they are not using the computers as kids do in Miami?" In this post a similar notion is that debates around "impact" of ICT seem to look for an all-or-nothing positive effect, not the possibility of some degrees of positive effects mixed with some only partially achieved positive effects and maybe some areas were effects were not positive at all. You had 5 very reasonable goals at the outset of the project, as listed above. So these should be the basis for measuring your success and your impact. It is worth noting that none of these original rationales had to do with improved math or literacy (or history or geography) scores, which may be why those were not observable gains according to the evaluation. We can only assume that this is the ultimate goal of any school reform program, but we have to be careful about judging the 'success' of any program against our criteria/rationale/aspirations and not those of the program in question or what it was designed to do. I would also very much like to see the study, and be able to reference, you mention on the effect of the program on attitudes and motivation. The IADB evaluation didn't seem to find any effect on this or on attendance. Personally, I do not doubt or question the investment in ICT for education. I fully believe that technology can improve the learning experience and the outcomes. But there are great differences in how we implement them. 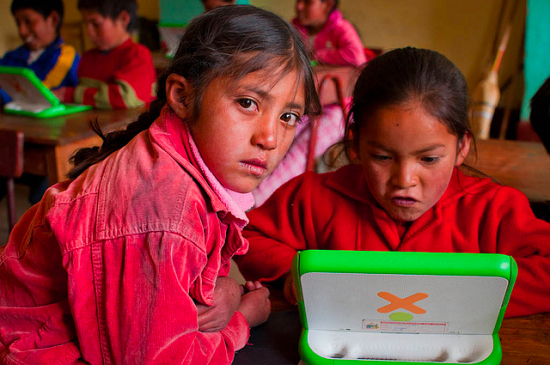 I see in Peru a great experiment to see if OLPC’s core idea of dropping XO’s from the sky into poor communities will have impact. Yes, I agree with Oscar that there were compelling reasons for the approach they took, yet that doesn’t mean its an approach that should’ve been taken. Especially one with such a contentious idea that has so many lives in the balance. And I am not just talking about Peruvian children. For better or worse, ICT4E = OLPC in many minds and as we see here, OLPC’s Peru’s approach isn’t showing the results that OLPC Uruguay is. The success of OLPC Uruguay has inspired other countries to forge ahead with large investments in ICT4E. The OLPC Peru experience, not so much I suspect. Had OLPC Peru been the only example, there would be a chill in the 1:1 space. So thanks for making OLPC Peru happen, Oscar & et all, but I am one to say its better to start with a high probability of success, not a doom to failure, even if that means less radical interventions starting with less underprivileged students. Wayan. I completely agree with your statement: "there are great differences in how we implement them". But for some reason it appears that it's you who doesn't completely believe in it. Let me explain. For what Oscar wrote on his article the objectives of the project and its genesis is more than clear. Now, why that approach not a valid one if we believe that we can implement differently? I tend to think that the answer is rooted in very valid and philanthropic desires. The thirst that we all in the ICT4E community have for reading about amazing improvements in education by using technology sometimes betrays us and keeps us from understanding success in its pure essence: the way you socially envision it. For me, what OLPC Peru has achieved so far is divided in several zones as @spouez just mentioned some successful–others not so much. But what is more important for me here is to stress that OLPC is a socio-educational project, which means it can pursue goals in both spheres. From what I can understand of Oscar's presentation OLPC Peru's objectives are pointing to a greater change in society and educational communities based on a well documented situation: teachers need more support. 1. It started a large scale policy by the population that usually is not the target–a very innovative approach and in that endeavor the are being successful. They showed a country that even the most neglected can be at the top. I call that equity and it's a deep social change where even developed countries fail. In my eyes, success. 2. They provide access to more than 30% of students in primary schools, especially those in the most remote areas. Access has always been a great concern. Again I can smell success here. 3. The government cleverly read that the poorest communities needed a solution for digital divide by analyzing the behavior of the wealthy ones. Even as a start it seems to me like a good decision to make. Even if you judge that on the educational side, right now, the outcomes are not the ones you expect, but we have to be logical and accept that the platform is in place and that will make possible many other ICT4E initiatives to take place as well as many other educational and social changes. It is understandable to expect a lot more from a program of such dimensions. And it is those dimensions that make nearly irrelevant the comparative with the Uruguayan case where roughly 450.000 laptops can cover the whole primary sector countrywide. I do think the results will come and this kind of spaces are a good way to promote it but also to make it constructive. From my humble perspective I can clearly see many successes if you look at this project from the lens of 'how they decided to implement it'. And that decision again seems for me a valid one, one rooted on a social change in the short-term and an educational one in the short, mid and long one. If we 'believe' a little bit more in long term objectives and put more of our efforts around these valid questions that sometimes lead us just to criticize instead of criticize and construct I can assure you not just Peru but many other projects will offer us the bibliography we all are expecting. Let's believe together in difference and build success from there. Óscar, es inútil tapar el sol con un dedo. Sincera los montos de inversión y muestra los instrumentos de medición de logros. Los que estan fuera de Perú desconocen las cuchipandas del manejo de las XO y detalles importantes de los niveles de corrupción de la gestion aprieta. After reading Oscar's article and arguments in favor and against some of the outcomes, I am left with an incredible need to know much more about the program and how its individual components favored or not some of these outcomes, and others that have been even considered. I refuse to believe that a program of this scope and complexity could be summarized in a few indicators… some of the results may validate or not the individual intuitions (of different kind and nature), but there is much more to say about the program's evolution: the individual components (and its interaction), policy around the program, the unexpected aspects that emerged, perhaps missing elements of support and infrastructure, detail work of the children (at home and school), etc. to inform not only the program in Peru, but any program in technology and education. After reading Oscar's article and arguments in favor and against some of the outcomes, I am left with an incredible need to know much more about the program and how its individual components favored or not some of these outcomes, and others that haven't been even considered. ¿Cuanto tiempo le demoró el estudio previo a la compra de las computadoras? ¿Era parte de su trabajo ver la parte de capacitción de los docentes en razonmiento matematico y compresión lectora? ¿jusitifica el gasto el supuesto estudio de impacto de motivacion intrinseca que realizó? ¿Donde está ese estudio? ¿Por qué ahora usted se encuentra trabajando en la contraloría de la republica? ¿Por que el proyecto de las OLPC se creo de la nada luego de que iniciaran las conversaciones en la PCM acerca del el TLC con EEUU? ¿Por que se aprovó tal compra sin que antes haya una aprobación técnica real de parte de CODESI o la ONGEI? El proyecto OLPC es un buen proyecto, el problema de su fracaso en el Perú fue por que se inció por personas inadecuadas, por motivos inadecuados y se gestionó por personas inadecuadas, bajo una premisa equivocada. Con todo respeto señor becerra usted una vez dijo que los mayores descubrimientos del mundo se habian hecho inesperaaadamente sin planearlos y esta bien es cierto, pero por favor la proxima vez que quiera descubrir algo, no lo haga con el dinero de todos los peruanos, y no tampoco con la esperanza de los niños más pobres del país. vulturs eat dead corpses, our educational system might be bad but it is not dead, nor are our people and children who, thanks to Una Laptop por Niño, have improved their ICT and cognitive skills, according to the IADB study published last month. I was among the few lucky people who were able to work to make it happen. Mephisto, you are so short sighted it is not even funny. Everything said from start to finish in this thread and in OLPC from day one is about a social change that will take decades, and even generations to see the real results, not pico-second snapshot 'results'. Unlike some, I did not expect OLPC to magically make every child who uses one to instantly (or even after a year or even 10) turn into a modern genius. It is about giving every child that OPPORTUNITY. For me, out of a million laptops, if only 10 or 20 percent of the children REALLY engage with it, that is 1-200,000 more children that are actually reached. Of those maybe only 10 percent have or can make further opportunity to get higher education(as opposed to maybe 1 percent without XO exposure). That's a 900 percent increase in that could not even be measured for nearly 10 years, and will be completely invisible for at least 5 years. Meanwhile, for every child that HAS engaged, and IS learning, and learning HOW to learn, the OPPORTUNITY -can- result in changes for the rest of their life, even if they never use technology again beyond school. Meanwhile, some of those poor children in remote villages are learning RIGHT NOW, AS I POST THIS, that there are mean-spirited folks like you in the world who would have DENIED them that opportunity, shut them out of the world of computers and internet, since it would not immediately do whatever it is that you want done. SO WHAT if it was not a magic universal solution to poverty that you seem to lust after, it is something that, in future years, we may see changing lives, villages, and even Peru. There is every possibility that 10-15 years from now, a newly elected leader in Peru will raise a battered XO over their head and proclaim that this little box was what got him/her interested and enabled in really learning, and provided the start they needed to begin making a difference in their country. Go peddle your harping gloom elsewhere. We all know there is nothing new under the sun where you are concerned, whining after the leeks of Egypt. What is the ICT industry approach (as alluded to in the question 2 response) and what in your view is wrong with it?